When she was gone, I missed her something terrible! Especially after she went off to the second camp, I immediately yearned to have her back. I guess the reason it was so hard the next week she was gone is because it was a camp I wasn’t as familiar with. She went to the second camp with a neighbor’s family and not with our church, so I knew she would be surrounded, mostly, by people she didn’t know. People I didn’t know. She left on an adventure without me — emphasis on “without ME” — and I just wanted her back. When my independent (OK, I’ll say it) BIG girl left her mama a second time, she didn’t even glance back at me after I dropped her off with the neighbor and walked back toward our house. I know because I watched. Throughout the week she was gone, this eagerness to have her back in my arms and under my care grew. When the day finally came she was to return home, my longing for my girl had grown into this insatiable hunger. I remember obsessing about how much I wanted to hug her and to love on her. It’s often in times like these, where my emotions have been revved up so high it’s as if I’m about to ignite into flames, I suddenly hear God speak to me. I have to tell you, I was a little shocked by this. Not because I don’t know how much God loves me, I most certainly do. He loved me so much He gave His one and only Son to die for me, for us (John 3:16). These words from my Savior gave me pause because it wasn’t as if I ever left Him for extended periods of time to go off on my own adventures, like my oldest had done. Is it not true that even though we aren’t ever physically from God’s view, spiritually we can be thousands of miles away from His loving gaze? As if we have turned our backs on Him to run off on our own in search of self-fulfillment? Too busy for a quiet time? Too concerned with other priorities to go to church? Too preoccupied to pray with a friend or to witness to the lost? Having my oldest away from me at camp for such a long time had just given me a glimpse into how our loving Father feels about us when we are spiritually far away from Him. He, too, becomes eager for our return, desirous of the time when He can yet again lavish His love and His peace upon us. When Jesus told the story of the prodigal son, He created an illustration of God’s longing for His distant children and His great love for them. And upon a close inspection of this timeless tale, we can uncover just how we, when we don’t make time for God, have in common with this wayward child. The story opens in Luke 15, saying: “There was a man who had two sons. The younger one said to his father, ‘Father, give me my share of the estate.’ So he divided his property between them. Not long after that, the younger son got together all he had, set off for a distant country and there squandered his wealth in wild living” (v. 11). In this parable, the father parallels God, and the son parallels a person in spiritual rebellion against Him. The first thing a reader should notice is that this son chooses to go off on an adventure far away from his father. This is a choice. How often do we choose to do the same thing? How often do we start our days immediately going off on adventures of our own choosing without so much as a backward glance to our Father? Then, notice what else it says in the opening verse to this story. It says that the son “squandered” his wealth. Now, remember where he got this wealth? The father. So technically, it wasn’t his wealth he wasted. It was the father’s. Again, how often do we do this? How often do we wastefully cast aside what God desires to freely gives us in favor of squalor? Now let’s pause a moment and examine our own lives. How many times have we ended up in this same position? Having lived day in and day out the way we see fit, only to be so spiritually hungry we try to fill that void with whatever will seemingly do the trick? Relationships? Work? Social media? Do you need to do this today? Do you need to go to God and ask for forgiveness? Whether it be as a Christian to repent of a transgression or as a lost sinner in need of salvation, we can go to God the Father and ask for what we need. And He is eagerly waiting for us to run into His open arms! Whatever is going on in your life today, don’t neglect your heavenly Father. 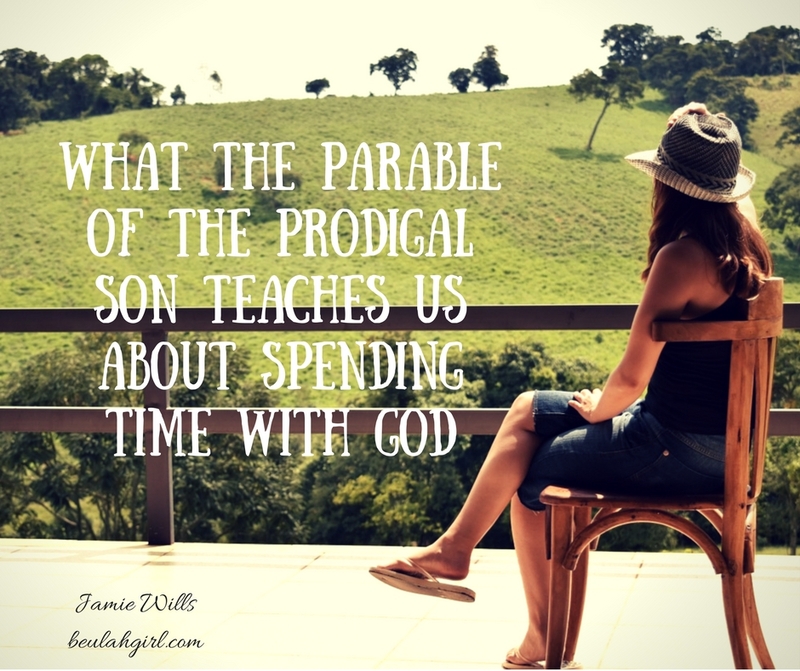 As is so beautifully illustrated in the story of the prodigal son, God wants you to want Him. He loves us, and He wants to show us His amazing love. If only we would let Him! When Beth came home from her second church camp, I was overjoyed to hear her knock on the door to our home. I flung it open, embraced her, and twirled her around while squealing, “I’ve missed you!” We then spent most of that evening together, enjoying each other’s company. Each day, the Savior waits, eager to embrace you and enjoy your company. Don’t opt instead to tackle the day on your own. He wants to clothe you in His best and celebrate life with you. Call on Him, today.